Mobile Messaging clients are the flavour of the season – Whatsapp, Line, Wechat and our very own homegrown Hike are at war with each other to garner global market share. Each one of them are coming up with features and schemes to entice customers into their fold. The latest is from Viber – They have introduced ultra low calling rates on “Viber Out”, that allow users to call internationally through VOIP. 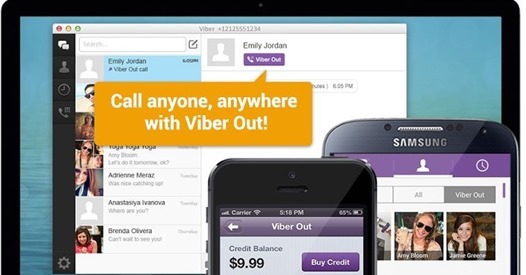 While the calls and text messaging between Viber users is completely free, if a user wants to call a landline or a mobile phone that does not have Viber installed, they can do it through “Viber Out”. The service is very similar to “Skype Out”. Viber Out enables all Viber users to call anyone worldwide at low rates on Android, iPhone as well as Desktop (soon launching on Windows Phone). Users will simply need to purchase credit for Viber Out can be completed either through a simple in-app purchase via either the Google Play Store or the Apple App Store or using a credit card via Viber Desktop. 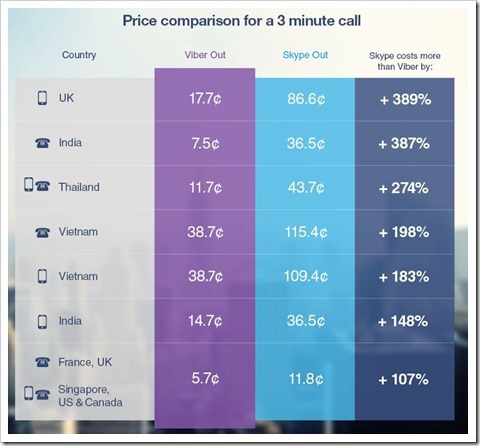 The most appealing aspect about Viber Out is the significantly lower call rates as compared to other competing platforms like Skype. The rates are less than half in many countries and also do not attract any connection charges. Here is a comparison for a 3 minute call as compared to Skype Out. Viber Out also has some additional features which other services do not provide – Viber Out displays your real phone number to the recipient so he or she knows who is calling. Further, Viber Out on Desktop has users’ phone’s address book so there is no need to remember numbers or dial them manually. International calling is one of the important revenue channels for telecom providers. With VOIP, calling rates are falling drastically. And with smartphone numbers growing, many users have started using apps like Viber, Skype and Kakaotalk to make international calls as it brings huge savings. Telecom Operators have to take a note of this, and will now have to further reduce their prices on international calling. For example a mobile call while roaming abroad costs upwards Rs. 30 per minute. The same call on Viber will roughly cost Rs. 3 per minute. So, if you call internationally, you should give a try to Viber, you will surely end up saving lot of money! Qualcomm Brings Snapdragon 410 64-bit Chip For Emerging Markets. My Question – Why? Flipkart Responds To Amazon, Launches In-A-Day Guaranteed Delivery In 7 Cities! Viber Instant Messenger Comes To Desktop!